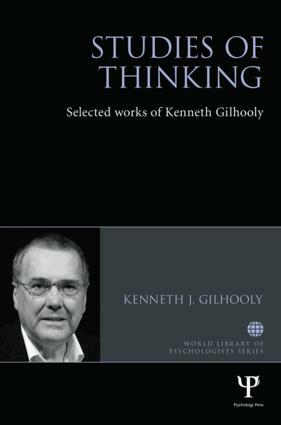 Kenneth Gilhooly has an international reputation as an eminent scholar and pioneer in the field of thinking and reasoning. The book covers key works on problem solving, expertise, working memory and thinking, and ageing. A specially written introduction gives an overview of his career and contextualises the selection in relation to changes in the field during this time. The book enables the reader to trace developments in thinking and reasoning over the last forty years.It will be essential reading students and researchers of cognitive psychology interested in the history of thinking and reasoning. Kenneth J. Gilhooly is Research Professor of Quantitative Gerontology at Brunel University, UK and Emeritus Professor at the University of Hertfordshire, UK. He is former Chair of the Cognitive Section of the BPS and has served on the ESRC Research Grants Board and the ESRC College of Assessors.